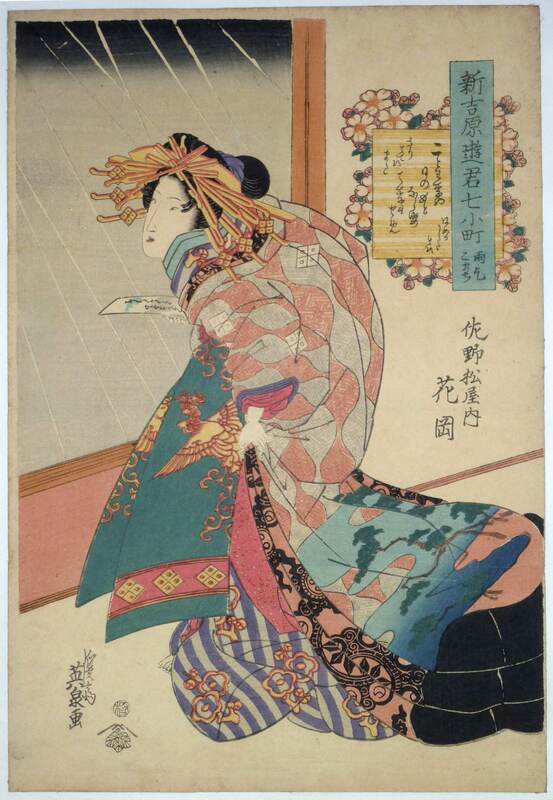 The courtesan Hanaoka of the Sanomatsuya House in the Shin Yoshiwara looking out at the rain and holding a poem slip. Episode Amagoi from a Seven Komachi set: Shin Yoshiwara yugimi nana Komachi. The set based on the seven episodes in the life of the famous 9th century poetess Ono no Komachi. Published by Tsuta-ya, c 1830. Very good impression. This is the first state with gradation in the sky and at the end of Hanaoka’s robe. Superb, unfaded colour. Fine condition; full size. Signed Keisai Eisen ga.